Since the moment your first pimple popped up on your face, everyone started telling you that chocolate was out of the question now. No more candy bars, no more chocolate cake or pies. Chocolate ice cream was a thing of the past. Don’t even think about chocolate chip cookies. And they were right. They knew there was something going on; that there was connection between chocolate and breakouts. What they didn’t know was that the chocolate wasn’t the problem. The milk fats, oil and other greasy ingredients that make milk chocolate and processed cocoa’s were the problem. Fortunately, that has been figured out and now, back to chocolate! Skip the milk chocolate. Go pure, dark chocolate or cocoa. Cocoa is packed with an amazing amount of antioxidants. Today’s skin needs those antioxidants more than ever with all of the pollutants in the air. Antioxidants rid the skin and body of cancer causing free-radicals by providing the stabilizing oxygen atom they need. Chocolate to the rescue! Chocolate also contains tryptophan, which is an amino acid that promotes the release of serotonin. Tryptophan creates a feeling of euphoria and it’s tryptophan that is thought to be released when we perceive the feeling of love. Serotonin is thought to be a mood regulator and is what causes feelings of happiness and contentment. Cocoa in powder form can also act as a bit of an exfoliator and scrub away dead skin cells to smooth the skin. When cocoa is in it’s rawest form, it’s at it’s highest level of potency. 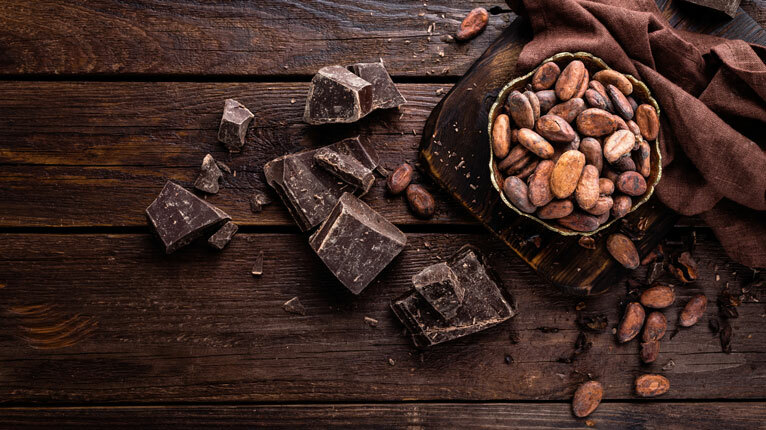 Processing cocoa into cocoa powder and chocolate can lessen the efficacy of this amazing little bean, but if done properly, there is still plenty of power left to greatly and positively affect the skin of both acne sufferers and clear skinned individuals alike. Alternatively, when cocoa is not processed correctly, is over processed or is filled with ingredients such as milk fat or sugar to change the taste, cocoa can become quite benign. And it’s this types of chocolate that those with acne must avoid. Luckily, cocoa that is processed correctly is available and can be used for more than just cooking. Chocolate and cocoa can be used for skin care products as well. There is a brand of makeup called To Faced that even uses cocoa in their products… and they smell so good. They offer blushes, bronzers and eyeshadows with cocoa in them. So how do you find skin care products with chocolate in them, you ask? Easy, go to the grocery store. If you suffer from acne, there is a pretty good chance that you’ve tried all kinds of healing methods ranging from prescription medications, to commercial treatments like Proactive, to DIY at home remedies. Cocoa goes on the list for home remedies and it is so worth it. Getting cocoa that is processed correctly may seem pricey at first but when you consider the cost of prescriptions and commercial skin care lines, it’s really not expensive at all. Go grab some but make sure to do your research on what brands are processed correctly. Whip up these recipes that use cocoa to treat acne. They work really fantastic because they also include other ingredients that help to treat acne as well. Such as oatmeal for it’s moisturizing and anti-inflammatory properties, heavy cream for lactic acid and lemon for antibacterials. Mix all the ingredient until the mass in consistent. Apply on the face, gently massaging it so that oatmeal can start exfoliating the dead skin cell layer (See more about oatmeal masks here). Leave it on for about 15 to 20 minutes and rinse off with lukewarm water. It’s that easy. And sure, if you really wanted to, you could even eat it. Now that you have some great ideas for topical uses for chocolate, it’s probably a fact that you’d like to eat some too. If you’re not big on eating your facial mask then try adding cocoa to your food. From savory to sweet, chocolate adds a unique flavor to almost anything and the benefits are endless. Now that you know all these benefits of chocolate, not only can you be guilt free while eating it (remember we’re not talking milk chocolate here but a purer, more natural dark chocolate or cocoa), you can prepare an excellent chocolate face mask recipe to nourish your skin and give you a beautiful, youthful look. No more running away from it. Run TO it! The results just might astound you and you don’t even have to call it a guilty pleasure anymore. It’s a healthy pleasure and your skin and body will thank you.